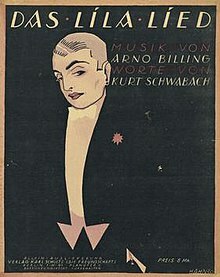 "Das lila Lied" (German for "The Lavender Song") is a German cabaret song written in 1920 with lyrics by Kurt Schwabach [de] and music by Mischa Spoliansky and is considered one of the first gay anthems. The song is a product of Germany's Weimar Republic, during which time lesbians and gay men enjoyed a short period of improvement in quality of life when the government established basic democratic rights that covered the LGBT community and abolished censorship. The song was written after the Institut für Sexualwissenschaft (Institute for Sexual Science) under Magnus Hirschfeld made worldwide news with its "First International Conference for Sexual Reform" which called for regulations on sexual behavior to be based on science instead of religion or other unscientific tradition. daß sie von ander'm Holz! and in its kind related? to be cut from different cloth! and who are only up to the trivial. because we are just different from the others! selbst wollte man uns hängen. wir leiden nicht mehr, sondern sind gelitten! morals of others on us? even if they want to hang us. our sun will be shining too. we will not suffer anymore, but we will be tolerated! This 1920s song article is a stub. You can help Wikipedia by expanding it. This page was last edited on 7 October 2018, at 10:15 (UTC).